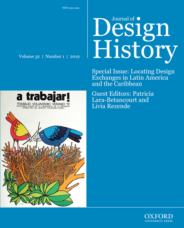 Journal of Design History is a leading journal in its field. It plays an active role in the development of design history, as well as contributing to to the broader field of studies of visual and material culture. For those of us used to visiting historical houses and encyclopedic museums, the word “period room” will sound familiar. A period room is a display combining architectural components, pieces of furniture, and decorative objects organized to evoke—and in some rare cases recreate—an interior, very often domestic and dating from a past era. Period rooms were widespread among European museums during the last decades of the nineteenth century, and became popular in North American institutions in the early twentieth. They have long counted among museums’ most popular displays. Their appeal is in part due to their cohesiveness coupled with their immersive format, two features that made them comparable to time capsules. Yet, over the past decades, many curators and scholars have condemned period rooms for occupying (too) large a surface area in increasingly crowded galleries, for their lack of flexibility, as well as for their doubtful authenticity, which is often seen as a threat to the value and authority of museum collections. But the debate about whether period rooms are “authentic” or “fake” tends to ignore what they really are: a museum-made object. Indeed, it is extremely rare that a former interior is transposed without any transformation into a museum to become a period room. Curators of period rooms select objects such as wood paneling, mantelpieces, flooring, chairs, tables, vases, and tapestries, to name only a few, and put them together to form what appears to be a bedroom, a kitchen, or any other built environment the museum decides to put on display. Moreover, these elements usually come from various locations. Museum staff can modify wood panels to meet specific constraints in the galleries and custom make some components (such as plaster cornices). Although the ensemble formed almost never existed prior to its display by the museum, it needs to look as seamless as possible for the period room to be credible to visitors. Image Credit: Room from a hotel in the Cours d’Albret, Bordeaux. Carving attributed to Barthélemy Cabirol and his workshop, ca. 1785, with later additions. Gift of Mrs. Herbert N. Straus, 1943. Metropolitan Museum of Art, New York. CC0 by Public Domain. The ambiguity between the material status of the period room as an object created by the museum and its display as an example of a specific room (e.g. a French eighteenth-century boudoir, a Spanish seventeenth-century bedroom, etc.) from a bygone era may appear unsettling. But it does not mean that the museum intends to fool visitors by making them believe in a forgery. However, the assessment of their value needs to take into consideration two things. First, while a period room provides information about the historical period represented by its furnishing and décor, it teaches us at least as much about the historical moment when the period room was installed in the museum. Second, history and fiction are not necessarily in contradiction. 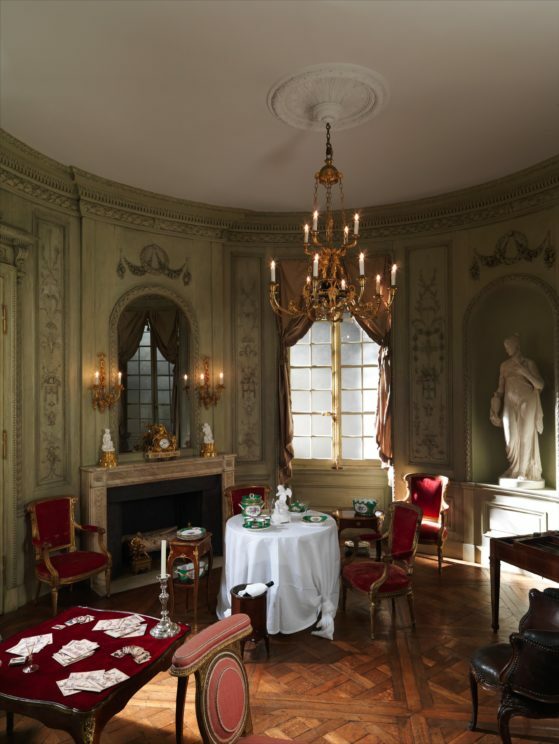 A period room refers to both the past and the present. The way we look at the past is always informed by current concerns insofar as our interpretation of objects and events from previous centuries changes in agreement with the advancement of knowledge and with what is considered relevant and worthy of interest in the present. For instance, referring to “times of national crisis” and “patriotic celebration,” Hillary Murtha explains that “the pervasive nationalism of such moments has often been a driving force behind the (re)interpretation of American period rooms.” The life story of a period room, how it was interpreted and altered through time, offers an interesting perspective on the culture that created it. Regarding the relationship between history and fiction, it is common to consider them as antithetical, especially when thinking about the production and dissemination of knowledge. Yet, the French philosopher Paul Ricoeur has shown that both are intimately related, especially with respect to their narrative qualities. According to Ricoeur, to dismiss their connection is to adopt a “positivist” conception of history and an “anti-referential” approach to literature. In other words, dismissing the connection between history and fiction means rejecting the importance of interpretation in historical facts and believing that fiction exists in a vacuum, impervious to the external world. In the case of the period room, the encounter between history and fiction occurs in the process of its making, in its staging to recall daily activities, or in its mediation by interpreters dressed in period costumes. To overlook the intermingling of history and fiction is therefore to forget their joint contribution to the cognitive process through which one – whether curator, interpreter, or visitor – makes sense of something as foreign as the past. These ideas are often overshadowed by a conception of authenticity that focuses on the accuracy of the historical moment represented in the period rooms. But it’s also important to consider the significance of how curators fashion such displays. To acknowledge this process and—even more daring—to bring it to the fore in the museum involves a shift from thinking about the period room as a way of defining and freezing in time societies of the past to thinking about these sort of displays as a way to better understand how a society constructs its own identity through its conception of history. Because it raises questions about how societies approach the past, make sense of it, and put it on display, about what is shown, what remains hidden, and why, to think about the making process of period rooms opens up new avenues to (re)consider their current value. Featured image credit: “Castle” by Tama66. Public Domain via Pixabay. Dr Marie-Ève Marchand is Affiliate Assistant Professor in the Department of Art History at Concordia University (Montreal) and teaches art history and museology as a sessional lecturer in the Province of Quebec (Canada). Her research focuses on the so-called decorative arts. She examines the epistemological issues arising from their collecting and display in both museums and domestic interiors during the long nineteenth century, with a special interest for their materiality and agency. She has published many articles and book chapters on decorative arts and on period rooms, which she studied at length in her doctoral dissertation. She is the co-editor of the volume Design & Agency (Bloomsbury Academic, forthcoming). Her paper ‘A Parisian Boudoir in London: The South Kensington Museum Sérilly Room,’ published in Journal of Design History, was recently included in a collection on Art Spaces from Oxford's Art Journals.